Early last Tuesday morning, after pulling on too-tight jeans and too large estate sale cowboy boots I opened our cabin door to find two college gals ready to watch our boys for a couple hours. We heard this was one of the best parts of Pine Cove. An adult morning. 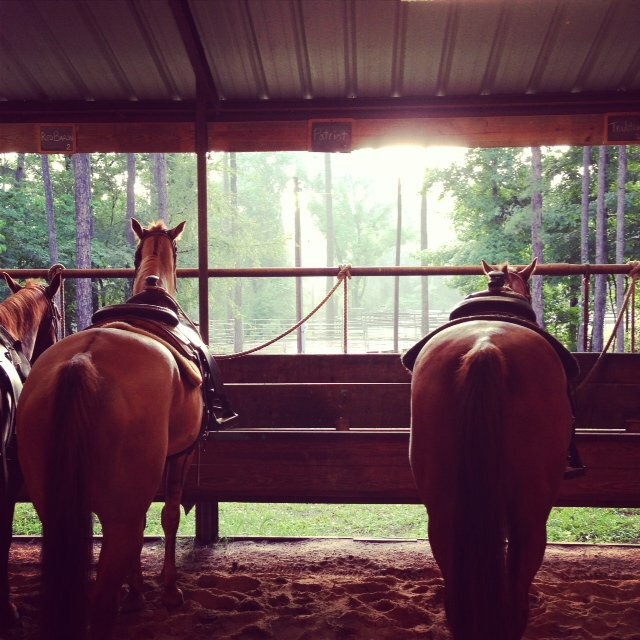 Including horseback riding and a delicious cowboy breakfast (we’re talking maple syrup soaked bacon, y’all!). I expected to enjoy doing something “earthy” and anti-urban. I got excited about the extra time with just Bruce and our friends. I didn’t expect to be given the most memorable parenting wisdom for the week. After a brief lesson from the head wrangler, he assigned us to a horse. We were given the simple instruction to keep our horse facing a rope hanging down from the side of the barn. 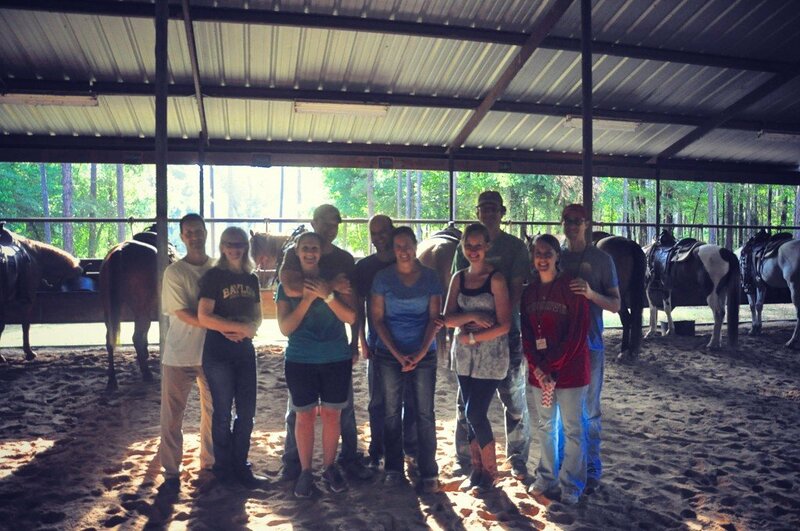 We were also instructed on the importance of these first few minutes establishing a relationship with our horse. How gently we sat down on the horse & how we took control determined how the rest of the ride would go. I was swinging my leg around the saddle to sit atop my horse, “Patriot”, when my neighbor’s horse “Red Baron” decided he wanted to get away from his neighboring (apparently evil) horse “Tank”. Unfortunately that meant the Red Baron no longer wanted to face his rope. Instead he wanted to turn around and head out of the barn. The shocked rider attempted to pull the rein back toward the assigned spot, but her horse was determined otherwise. But that lasted about a minute before Red Baron tried to turn around again. Maybe she was remembering our earlier lesson about the importance of establishing control. Maybe she wondered, is it okay that her horse had just “broken ranks”? What about on the trail ride, would he continue to go off course? Maybe she should switch horses? That’s about the time I made the parenting connection. Just as I continue to strive to live like Christ, my boys are only following me on that path. We lined up our horses for the trail ride. Again Red Baron decided to take a detour. Another wrangler encouraged the rider, “Remember they can sense when you are afraid. They know when you lose your confidence. You are doing a great job. Just keep turning the reins back to the direction of the path”. This discipleship journey with my boys is so very similar. They will continue to go off-track. I shouldn’t be surprised or fearful or personally offended. Responding with anger or hurt or fear will not help get them back on the right path. As the rider gently directs the horse back in the direction it should go, so I need to respond firmly & gently, not emotionally or drastically. The rider that morning feared what the rest of the trail ride would look like if she had lost authority with her horse. Often I fear what the rest of my boys’ lives will look like if they act out or misbehave. I project their future selves instead of focusing in the moment on leading gently back to the path of righteousness. This image is seared in my mind. When the boys go off-course, just steer the reins back to center. May you be encouraged today mom. You are doing a great job. Keep hold of the reins to guide your children on the path of righteousness…gently. guiding. grace. 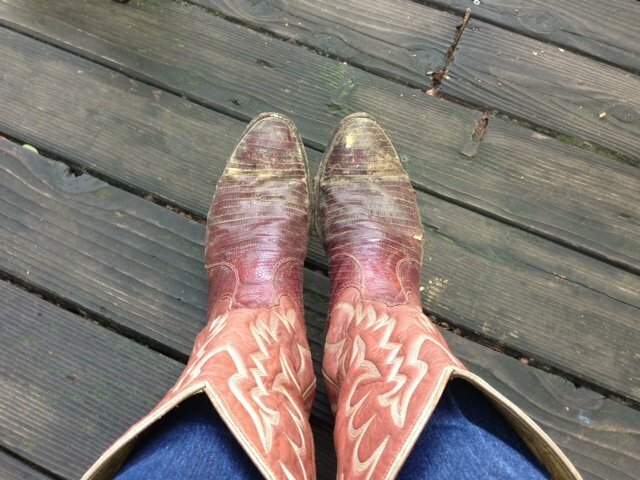 May your feet follow Christ’s example so your children can follow where you lead (even if you feel like the boots are a bit too big to fill…He will fill in the gaps). This is a great reminder. I often get frustrated and angry when my son continues to make the same mistakes over and over again. It is because I am looking inward, instead of up to God. Also, notice the wrangler didn’t say, “With a lot of brute force, shove the horse back into the right place.” No, he said to be gentle. By the way, Pine Cove is one of the most wonderful places on earth. It played such a major part in my life as a camper and as a staff member! Great point, Lydia…not “with lots of brute force…”. I’m now a huge Pine Cove fan. What a blessing you were able to serve there. Which camps did you work at? I worked at the Towers camp for the little kids. It was an amazing 2 summers! So true, Heather! I used to get so frustrated as a teacher when parents would sit down for conferences with me and show such contempt for their children’s behavior or performance. I was looking at the progress, knowing it takes much time to learn and grow whether behavior or in knowledge. I vowed that I would remember that as a parent-that they are kids, and noone arrives overnight. This visual is wonderful! Thank you for sharing it with us! Your students (and parents) were lucky to have you teach them! so often I feel like I’m the one trying to convince the teachers my boys haven’t “arrived” yet but are working towards becoming the men God made them to be (even as grown men they will be in the sanctification process until heaven). Thanks for your wise words and encouragement. So thankful to have connected with you online…now we need to meet IRL!! This was so life giving. What a great post to encourage all of us moms. We need these reminders. Thank you. thanks chica for the kind words! I know I needed the reminder myself. I love the way the Lord can take the ordinary moments and make them eternal, ah ha moments. Thanks for sharing this. I can totally relate and needed to hear this TODAY! He’s pretty awesome at revealing Himself all around us. I recently read that “blessing” means “infusion of God”. 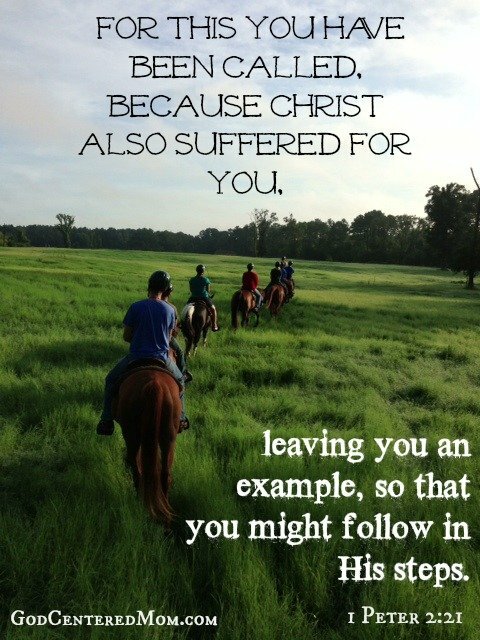 That morning on horseback was definitely a blessing. thanks for your comment! oh jacque! I just can’t believe I’ll get to see you in a few short weeks. may the Lord lift you up and remind you of how He has equipped you for just this time. You are blessing! really really really love this. Glad I got to be there with you, so neat that you shed light on this truth through our experience. Can you please repost this, oh…..once a week?? Thank you! soooo loved being with you at camp! I think I need to keep a copy for myself taped to the refrigerator! Love it! God is so good to speak through the ordinary in ways we can understand. Thanks for sharing this great lesson. He is soooo good. Blessing us with truth in unexpected ways. thanks for your encouragement. Thanks for the encouragement. This echoes a book I just finished reading called ” Grace-based Parenting.” Good reminder. Love you site. Funny you should mention that book. 4 mornings during camp we had a speaker, Dr. Eddy Shigley, leading us through Tim Kimmel’s “Raising Truly Great Kids” curriculum…which includes his Grace Based Parenting info! Definitely felt like that topic was on my mind when we were riding. Great book! My mom just sent me your post becuase I was a Pine Cove Towers Wrangler in 2008. Being a wrangler was one of the best experiences of my life and I will never forget all the lessons God taught me that summer. I constantly look back on that summer and how it shaped me and how it still helps me everyday in every situation. Hey kate! how fun is that? What a blessing to have been on staff at Pine Cove. I absolutely loved getting to know the college students and was so impressed by their desires to know God and serve others. Thanks for stopping by! I am printing this off and plastering this ALL OVER my house!!!!!!!!! I need to do the same sister! blessings. Wow, I needed that today! Thank you! thankful it could minister to you as God continues to etch this lesson in my heart (my often hard heart). blessings! Really just can’t even being to say how this encouraged me today! Thanks so much! What you said here– “I project their future selves instead of focusing in the moment on leading gently back to the path of righteousness.”–is what happens to me daily with our 4 young boys! Just thankful for this post! I definitely project what “could” happen based on what is actually happening. Trying to focus on the present heart issue rather than assuming what “may” be. Be encouraged fellow-4-boy-mom…God entrusted us with a big job to raise up godly men and He will equip us to see it to completion. We just need to stay focused on knowing God and trusting His plan. I needed this today. Thank you so much for such a wonderful, reflective post. Loved the article! Thank you SO much for the gentle reminder of discipling our children. Such great words. Thank you! I needed this. I have an almost-3-year-old boy who I’m having a boatload of issues with. I had to carry him kicking and screaming from the mall just over an hour ago and the whole encounter left me so drained, exhausted, and angry (especially because I did the same thing, multiple times, yesterday). I am at a loss as to what to do, how to discipline, how to gain control – I feel like nothing works and I feel like a complete failure. So thanks for a bit of encouragement. Thanks for this uplifting post. It reminds me of a wonderful parenting book called “Taming the spirited child” and everything in it is a horse analogy. Taming instead of breaking, leading instead of prodding, building corrals instead of tying them with ropes, etc. Great post! thanks for sharing! I’m a mom of 1,oldest of six children and I have worked in education/childcare for a number of years. So, I’ve basically been raising children my entire life. I know how difficult it can be to have patience with difficult children. Like your point about the horse needing constant, patient guidance, I try to remember that children need training. They aren’t born knowing how to act. They must be taught. Even us responsible grown-ups were once children who had to be trained, but if we turned out right, obviously our teachers and parents didn’t give up on us. Now, as an adult myself, It’s my turn to train a child or two. It’s tough, and sometimes they don’t listen, but persistence, patience, and a whole lot of grace pays off in the end. Thanks for a great post and the much needed encouragement 🙂 It’s good for me to remember how much my siblings and I bickered and just didn’t like each other, but now that we are all adults our relationships are much better. It’s a good reminder that how things are doesn’t mean that’s how they always will be! I like your phrase, “how things are doesn’t mean that’s how they always will be”. Praying peace over you as you go about loving your little ones.